The South African government is striving, through its National Development Plan, to ensure that the country has an efficient, competitive and responsive infrastructure network, including transport infrastructure, which is essential to transport people and goods and, thus, support the country's economy. The Department of Transport has, for the 2016/17 financial year, budgeted R24.5-billion to spend on road transport, R19-billion on rail transport, R11.7-billion on public transport and R79-million on integrated transport planning. Many national and provincial road projects are under way, despite the challenges of funding expansion and maintenance projects. 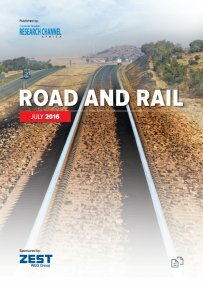 Creamer Media’s Road and Rail 2016 report examines South Africa’s road and rail transport system, with particular focus on the size and state of the country’s road and rail infrastructure, the funding and maintenance of these respective networks, and efforts to transfer road freight back onto rail. Published on: 28 July 2016.